I gave my first official sermon at Trinity Baptist Church this last Sunday. I went over 1 Corinthians 10:31 - 11:16. It can be a difficult passage to understand, but it's one that I've thought about a lot over the years. Here is a link to the audio file. Here is a link to the PowerPoint slides that I used. In our church small group, I was volunteered to lead the story and discussion last Sunday. The leader's notes I received instructed me to engage all five senses and be creative. They also told me to learn a summary of the life of Joseph from Genesis, and tell the story to the group. The summary I was to recite was 3 typed pages long. 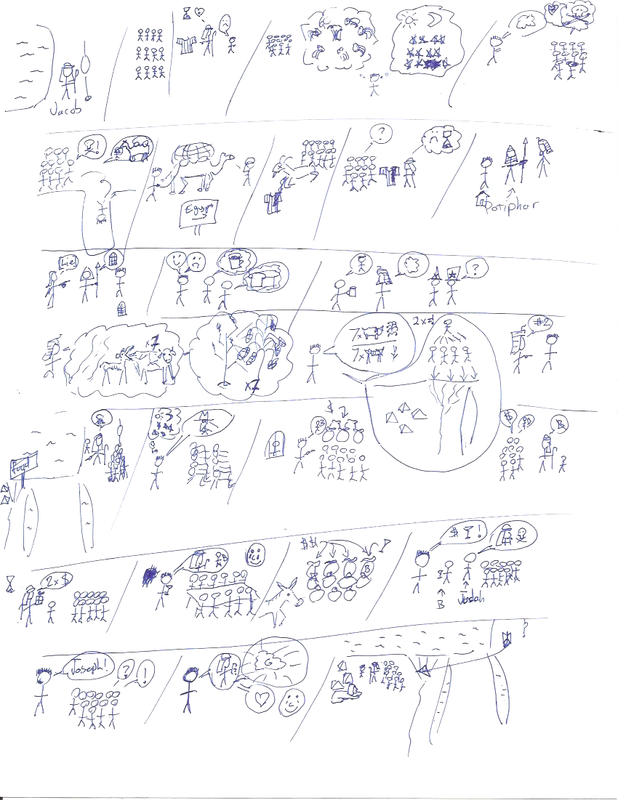 I was able to re-tell the entire detailed story to the group using just the drawings (no practice, even). In order to engage all five of their senses, the girls helped me to cut, bake, and decorate cookies in the shapes of objects related to the story (sheaves of wheat, cows, Jacob with his staff, Joseph with his many-colored coat, sun, moon, and stars, etc. ), and I brought some to share with the group. I provided copies of my illustrations to the group, and they were able to repeat the story back to me from the drawings as well. Here is a PDF version that I scanned and printed for the group.